While most women are unwilling to admit to others that they snore, there’s no denying the fact that snoring occurs in both men and women. It’s also true that while women do snore, it’s much more likely for men to snore than women. While the statistics vary, approximately two out of five men snore while only one out of four women snore. What is the reason for this disparity and what can men do to help level the playing field? Experts feel that there are a few reasons why men snore more than women. 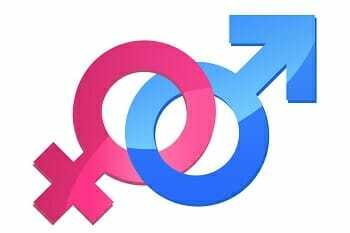 One of the most commonly cited reasons why men snore more than women has to do with the lifestyle choices that are typically associated with men vs women. Studies have concluded that men are more likely to engage in behaviors such as drinking alcohol, smoking or the use of sedatives. In many cultures, men are viewed as risk takers and are more prone to engage such harmful activities. Does smoking, drinking, and sedative use really have anything to do with snoring? Surprisingly, the answer is YES. A partial blockage in the airway which causes resistance in airflow is the number one reason why snoring occurs in both men and women. While asleep, the jaw tends to loosen up and relax as well as the tongue and surrounding muscles. When this occurs, the airway becomes somewhat pinched off. As air passes through a relaxed narrow airway, tissues begin to vibrate against each other which causes the sound of snoring that we are all familiar with. While a relaxed airway is often the primary cause of snoring, there are other conditions that may cause snoring such as an airway obstruction such as clogged sinuses due to a cold or another allergy. This is why you may have noticed that your snoring or your partner’s snoring worsens after a night of heavy drinking. The same is true for those who use sedatives such as sleeping pills which will also relax the airway and cause snoring. Smoking is yet another reason why snoring occurs and is also more common in men. According to the Kaiser Family Foundation, 19% of males and 14.7% of females smoke tobacco. Once again, this high-risk behavior can also be a major contributor to snoring. The act of inhaling smoke causes inflammation in the nostrils and airway. This swelling reduces the airflow capacity due to the narrowing of the passage. Once again, an airway that becomes narrow will move around and tissues flap against each other, resulting in the sound of snoring. Those who smoke more are more likely to snore than those who smoke less or not at all. 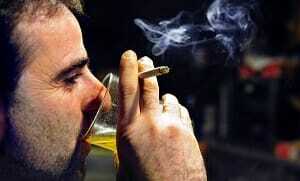 To further compound the issue, those who engage in behaviors such as drinking alcohol are also more likely to smoke. Anatomy differences are another reason why men tend to snore more than women. We already know the obvious differences in anatomy between men and women but what about the airway? Is there a difference between the airway of men and women and could this be yet another reason why men are more prone to snoring? Once again, the answer is YES. The pharynges, which are parts of the airway that prevents swallowing water or food into our lungs, are larger in men. Also, when sleeping in the horizontal position, the men tend to have greater movement in the airway in comparison to women. As if this weren’t enough, men have a voice box which rests lower than women’s, which increases the length of the airway. The lower voice box is the reason why men generally have deeper voices than women. The longer distance also increases the likelihood of airway collapse and ultimately snoring. What Can Men Do to Level the Playing Field? The bad news is that men were born predisposed to being a snorer but what can men do to reduce the likelihood of becoming a snorer? While you can not change your anatomy, there are a few changes that they can make to help level the playing field. Perhaps the most obvious way for men to reduce the chance of snoring is to completely avoid the activities that cause snoring such as drinking alcohol or smoking, especially before bed. While quitting either is not always easy, there are several free resources that are available which can help. Rethink Drinking is a government website that contains a lot of helpful information as well as tips to stop drinking. There are helpful tools and worksheets that are free to use. If you are trying to quit smoking, the website Smokefree.gov contains a lot of great information as well as helpful tools that will have you on your way to quitting smoking. One of the best ways to quit smoking or drinking is to avoid situations or other people who encourage these habits. Practicing good sleep hygiene will help you fall asleep faster and ensure quality sleep which can help to reduce snoring. Avoid eating a heavy meal or one that may cause indigestion prior to bed. Indigestion is not only uncomfortable, but it can keep you up at night and even contribute to snoring. Also stay away from fatty fried foods and spicy dishes before bed. Avoiding extended daytime napping is another consideration when it comes to good sleep hygiene. While a short nap which lasts less than one hour can recharge you, longer naps will prevent ultimately keep you up later at night. Establish a bedtime routine and abide by it. If you have a difficult time falling asleep, try taking a hot shower, drink a warm cup of non-caffeinated tea, or read a book prior to going to bed. Having a bedtime helps to ensure that you receive enough quality sleep which will not only provide energy for the next day but will also reduce the likelihood of snoring. Did you know that at least half of snorers are positional snorers, meaning that snoring occurs while laying on the back but does not occur while sleeping on their side? The reason for this is quite simple and has to do with the gravitational force of fat and muscle in the airway that’s responsible for reducing airflow while laying on your back. By laying on your side, you effectively shift the weight of the fat and muscle in the neck away from the airway which helps to prevent snoring. Use a wedge pillow or other device to help prop up your back and prevent rollover. There are actually belts that are made specifically for promoting side sleeping. If all efforts to reduce your snoring fail, you can always resort to a snoring mouthpiece, also known as a mandibular advancement device. There are several different models to choose from, although they all work in the same fashion by holding the jaw or tongue forward which prevents the airway from becoming restricted. Snoring mouthpieces are highly effective at reducing or eliminating the sound of snoring. Here you will find a great deal of information on these devices. Snoring mouthpieces for women – Is there a product made specifically for females?